Starting in Spring of 2007 as a landscape design applications class project in the Mt. Diablo Adult Education Gardening Program, in less than a year PHIG went from a plan on paper to the beginnings of an over 4000 square feet demonstration garden for water conservation and habitat restoration. 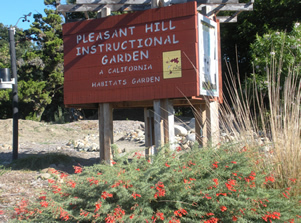 Thanks to donations and an all-volunteer effort with the assistance of many community organizations, the garden hosts a kiosk structure, arbor, benches, tools sheds, a storage workbench for classes and events, a composting system, and a variety of drought tolerant and California native plants in beds on what was formerly a scrap of wasteland used for overflow parking. What's the weather at PHIG? ?